I guess the main thing I was worried about was that they had modified the recipe to the point where the ingredients and taste were dramatically (and possibly detrimentally) dissimilar to the original. 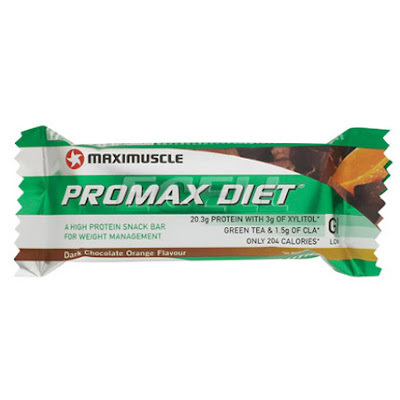 However one clear distinction that I'm guessing is now apparent is that, whereas before Promax Diet was for both men and women, and that was it, now it would seem that, while we still have Maximuscle Promax Diet Bars for the guys (and the girls if they so wish), Maxitone Sculptress is specifically aimed at the girls and is there to complement the rest of the range. Which, as I mentioned in my post the other day which detailed my initial thoughts on Maxitone, is as far as I’m concerned - a good thing! We deserve our own female-specific nutrition brand! In case you hadn’t noticed(!) I’m a very big fan of the Maximuscle/Maxitone protein shake range. From research and my own experiences I would consider drinking a protein shake as soon as possible after strenuous activity to be the very best means by which to get your protein - as the absorption rate is far superior to any other method. That being said I do consider the bars to be a superior in some respects due to, amongst other things, their portability - they travel so well! 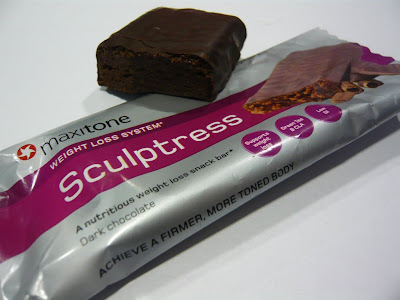 So, like the original Promax Diet Bars, Maxitone Sculptress Bars are incredibly tasty, dense and filling considering how few calories there are - 205 per bar!! They provide more than 20g of protein and also over 5g of fibre which is fantastic as that, along with the protein, helps to fill you up and keep you feeling fuller for longer. Plus, considering it is a 'chocolate' bar, it only contains 2.3g of saturated fat - that's pretty good huh?! These bars are a perfect complement to a healthy diet. But be under no illusion, they will NOT make you lose weight just by eating them alone. They, like the shakes, are designed to work in unison with your weight-loss programme and support your goals by providing you with optimum nutrition to both fuel your workouts and ensure adequate muscle recovery and rebuild afterwards. You cannot think "Oh, I'll just sit on my bum, watch TV and take a few Maxitone products twice a day and that'll be enough to drop the pounds". If you want to lose weight you have to effect change and that includes removing the obstacles to your weight loss - the biggest being overeating, and/or eating the wrong types of food, and inactivity. You will not see skinny, hungry looking hollow-eyed celebs endorsing these products, instead you will see slim, strong, healthy, sporty-looking real women who take their exercise and nutrition seriously. These women are the ones we, and our daughters, should aspire to look like. Not the bony dull-eyed ‘celebrities’ whose gaunt shapeless frames we’re forced to stare at in the media and believe to be the look we’re meant to strive to achieve! I don't think that Maxitone products are intended for those people looking for a quick fix, you have to put in the effort to see results - however, you will see them a lot faster if you have the right systems in place to support your goals. Get the exercise right, and the nutrition spot on and you will transform your body, trust me. Unlike basically all the other weight-loss products you find on the 'diet shelf', Maxitone doesn't make false promises like you'll "drop lbs within days", or claim to be able to remove fat from the food you consume, or, like a popular breakfast cereal, instruct you to replace your morning and lunch time meal with their products in order to "drop a dress size". Maxitone wants you to get up and get active whilst also eating sensibly - Maxitone wants you to set in place good and healthy long-term habits. After all, what happens when you stop eating that cereal for breakfast and lunch, or stop taking those diet pills and return to whatever pattern of eating and inactivity that encouraged the weight gain in the first place? I tell you what happens, you gain the weight back, and then some more for good measure!! So isn't it refreshing to have a brand that actually encourages you to adopt and maintain healthy lifestyle? As someone who spent over half her life in a negative relationship with both food and her body, I get very excited by companies and products that promote positive body change through a combination of healthy sensible eating and exercise. A company that endorses a strong, healthy and, above all: achievable look is one that wins my vote any day. If however you want a strong, but sleek, lean, healthy, firm shapely and toned body - one that you can be proud of - and you’re interested in seeing if and how Maxitone can help you achieve this then visit the Maxitone site for yourself. Check out the nutrition information and meal plans, take note of the exercise advice and examples and then choose the products which you think will best support your goals. If in doubt, ask the experts, or you can even ask me about my own experiences if you like, but all I would ask that you not expect it to be easy. If it's quick and easy then it's probably not worth doing, nothing that important is. As the saying goes “a road without obstacles probably doesn’t lead anywhere”. If you really and truly want to want to lose weight, keep it off and achieve the body of your dreams, then you need to put the work in. Ultimately it will be so worth it and the sense of achievement you get at the end is better than you could every imagine. But you need to be prepared to work for it. Us humans aren’t designed to sit at desks, on computers or sofas all day, we’re built to move and keep on moving, it’s what we’re good at, we’re capable of amazing feats of endurance. Before our weapons were advanced enough to catch our prey from afar we had to rely on our legs and our ability to run our prey down, however long it took. Some of us humans still enjoy that, like my nutty endurance running friend Dave, the Subversive Runner - he runs ultra marathons for FUN!! Now, I don’t have a burning desire to run a marathon but I fully intend to walk a few in my lifetime, all in aid of keeping on moving. We’re also not designed to eat junk food. A fellow blogger, Chocolate Button, posted this YouTube clip about a McDonald’s cheeseburger which, despite being left in the air for four years, without any form of preservation, hadn’t aged a bit - it’s quite scary really, it can’t be real food, real food decomposes! So if something is that far removed from being a real food, how is our body supposed to know what to do with it when we consume it? So, why not commit to starting to take yourself, your health and your nutrition, seriously - today! It will be the best decision you ever make. If you put the effort in, you will get the results you want, not immediately, but give yourself time, because time is what you’ll get back. The healthy changes you make now ensure that you live longer and feel fitter, stronger and happier for years to come. If you stick at it I promise you that you succeed - in fact, you can't fail! I guarantee you that very positive change you make, no matter how small, will pay you back tenfold in years to come. Stay strong, live long, feel happy and look great.